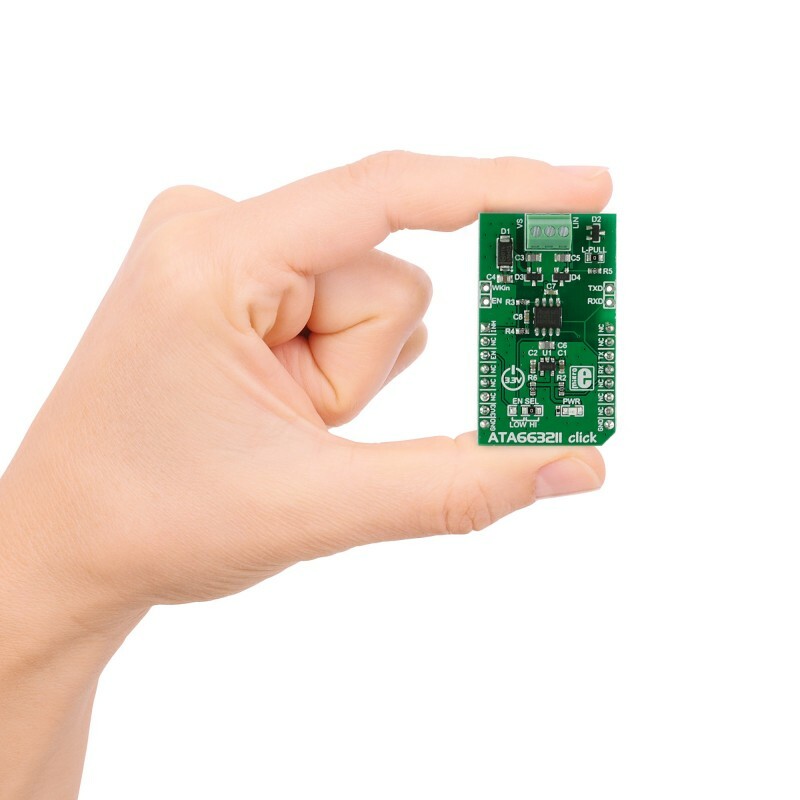 ATA663211 click carries an Atmel LIN transceiver IC designed to handle low-speed data communication in vehicles and in industrial applications with electrically harsh environments. The LIN connection is established by attaching wires to the onboard screw terminals. 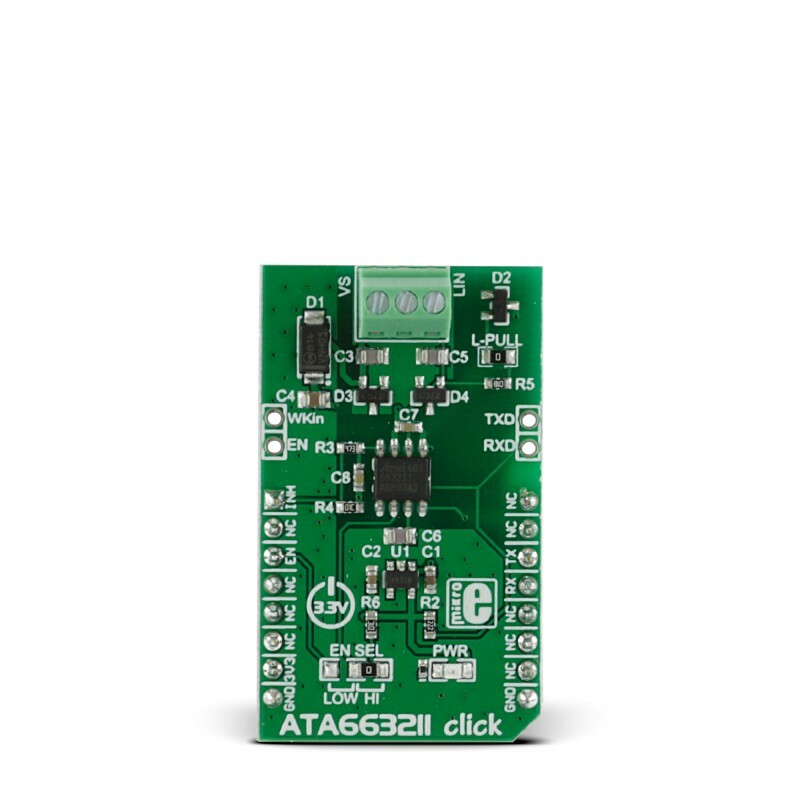 The click communicates with the target MCU through the UART interface and runs on a 3.3V power supply. ATA663211 click can aslo be used as a standalone LIN transceiver, without being connected to a mikroBUS™ socket. An onboard LDO (low-dropout regulator) enables it to get its power supply through the VS line screw terminal. LIN or Local Interconnect Network is a protocol used for communicating between components in vehicles. These days cars have hundreds of sensor applications to measure things like temperature, pressure, air flow, speed, etc. All these applications need to communicate with the main system. The LIN bus was created by European car manufactures in order to establish a new, uniform communication standard. It can be used with CAN (Controller Area Network), but LIN is more cost-effective for simple sensor networks in vehicles. For more information see our Learn article on the LIN network protocol. The IC has three very low power modes: normal, sleep and fail-safe. In sleep mode the current consumption is typically 9μA – this is the lowest current consumption mode. It automatically switches to fail-safe mode at system power-up or after a wake-up event. In fail-safe mode it typically uses 80μA. Automotive industry and other electrically harsh environments. LIN or Local Interconnect Network is a protocol used for communication between components in vehicles. The car industry has changed profoundly during this century. Cars have hundreds of sensor applications to measure things like temperature, pressure, air flow, speed, etc. All these applications need to communicate with the main system. The LIN bus was created by European car manufactures in order to establish a new, uniform communication standard. It can be used with CAN (Controller Area Network), but LIN is more cost-effective for simple sensor networks in vehicles. But what is the difference between LIN and CAN network protocols? CAN is an a really complex interface, and with so many electronic components in a car the manufactures needed a cheaper alternative. The LIN interface is simpler than CAN — LIN uses a single wire communication and the slave nodes are clocked by only one master. CAN interface has nodes that can act independently, receive messages and act. It can have more than one master on the CAN bus. A LIN network is usually made of up to 16 nodes - one master and 15 slaves. 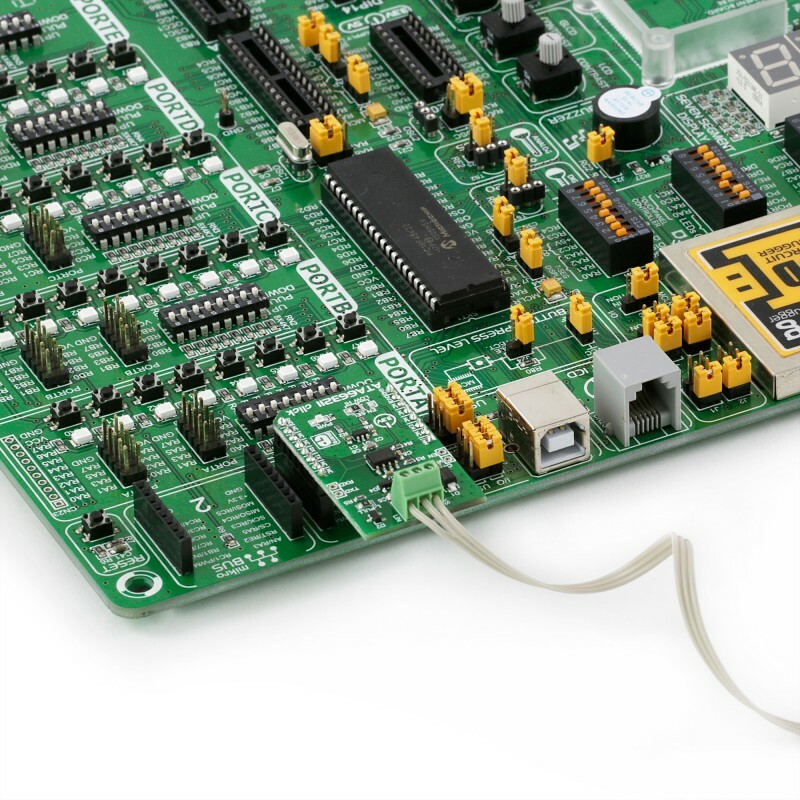 This serial communications protocol is also well suited for other industrial applications with electrically harsh environments. The click has three screw terminals: VS line for the power supply (up to 40V), GND for ground and LIN line for connecting to the other transceiver LIN line. This table shows how the pinout on ATA663211 click corresponds to the pinout on the mikroBUS™ socket. This table shows how the pinout on Grid-EYE click corresponds to the pinout on the mikroBUS™ socket (the latter shown in the two middle columns). WKIN — high-input voltage pin used to wake up the device from sleep mode. EN — controls the operating mode of the device. TXD and RXD — additional UART transmit and receive lines. 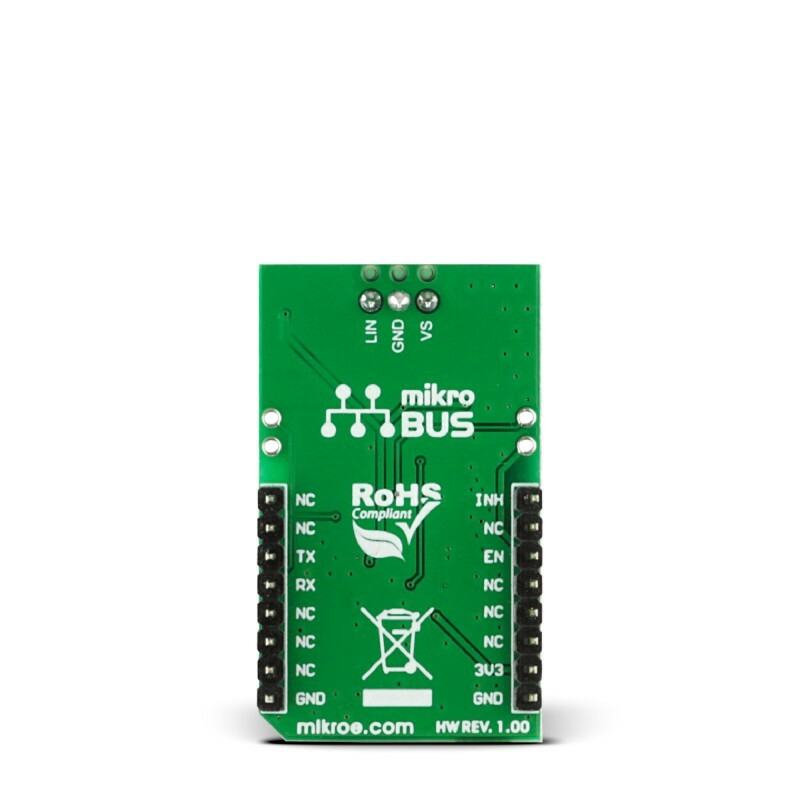 EN SEL jumper enables pin selection mode (by default it is always on, good for standalone purposes) otherwise can be LOW - then it is connected to EN pin on the mikroBUS. Maximum baud rate which achieved with 2 meter long cable is 19200 bps. Supported compilers C : ARM AVR FT90x PIC PIC32 The following code snippet shows a simple routine which prints received data on a terminal. Any time a click board receives 8 bytes of data it will print received data on another UART. In this case UART3 is used for ATA663211 and UART1 is used to log data.